Just a question as to your take on Mission of the Atonement. I saw that you blessed the labyrinth and know that this is a mixed Catholic/Lutheran church. Do you know if the retired priest consecrates with the Lutheran minister and why is this not in the Archdiocesan Oregon Catholic Directory as a valid church. Just want to get a handle on this. Since there has been no reply...and it's still going on, now it goes public. Mission of the Atonement Mission of the Atonement (Synergy in Action) is a blend of what they term "Catholics and Lutherans" using the same readings, songs, etc. UNTIL to comes to Communion. Then they say they each go in their own lines for this "sacrament". What Mission of the Atonement says about the Roman Catholic church from staff person Susie Snortum. "She identifies herself as Presbyterian, but loves the blurring of denominational lines in the interest of worshiping our one God together." NO FEAR OF LIVING AS HE WANTS. HE'S ABOVE THE TEACHING OF THE CHURCH? Some questions: why is this needed for unity when it means watering down our True Faith? How does this "priest" do the mass with the same text as a Lutheran? 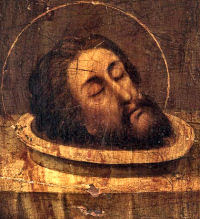 This is NOT the body and blood of our Lord Jesus Christ so why is Bishop Steiner approving of this fiasco? Why does this get any attention of all? Why does the Archdiocese allow this? Why does our Bishop "bless" a less than Christian labyrinth as a wonderful thing when it leads people away from the True Faith? (more coming your way about the labyrinth and its danger). Why is this NOT in the Catholic Directory, but encouraged, since it's still here? These are a few examples of the "rotten fruit of this spirit".. A degradation of our clergy, and values. 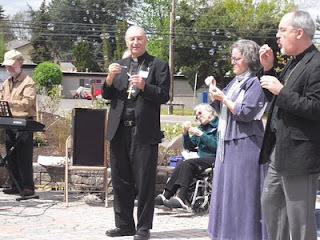 St. Andrew's Catholic Church, Portland, OR - (FATHER CHUCK LIENERT AGAIN Homosexual(active)Friendly and encouraged at all stages to continue and grow. It is not necessary to join MOTA to have an "Ecumenical" Church. Just have a Roman Catholic that stands firm in the faith with lots of friends outside the Church. We don't have to blur the Truth to make friends or to believe we really are better than plain old Roman Catholics. It's true Synergy at it's best. Good to receive this email! Where does the insanity end around this place? All the best. Carolyn, please remove me from your mailing list. Thank you. A teacher has a greater responsibility before God. Your request will be granted knowing that this could even be the way to think. Remember you are getting paid to be Roman Catholic and teaching the Truth and not an imitation to lead our children astray. I pray that you are just mad about BP Steiner blowing it. Carolyn, I know well the demands of my vocation. Thank you for honoring my request. PRAY....I know you are...but there's no other answer! Back in the 1970s, and I believe still continuing to this year, Catholics, Lutherans, and Methodists in Silverton used to get together for a similarly designed celebration on Palm Sunday. I’d have to check with my parents to see if it’s still going on for sure; but we got permission from the Archbishop to do it, AND the Lutherans insisted we check with the Vatican and use the proper Catholic form for the consecration. Still split into the three lines for communion though; as is proper, since transubstantiation does not equal consubstantiation does not equal whatever it is the Methodists believe in that escapes my mind right now. Another big Catholic/Lutheran experiment a lot closer to home for you than MOTA was Christian Renewal Center up on the North Fork of Silver Creek Falls. Originally started as a drug rehabilitation center by Pastor Allen (who died a couple of years back), many parishioners from St. Paul’s in Silverton and even the Knights of Columbus helped build the retreat center. And I’m sure you’re well aware that the Vatican has strongly supported such ecumenical movements for many years now; Pope Benedict himself negotiated the Joint Declaration on Justification with the World Lutheran Foundation, back when he was head of the Congregation for the Doctrine of the Faith, which removed the mutual excommunications that had persisted for 500 years. This Catholic/Lutheran group is not sanctioned by Rome. You are speaking I believe about gatherings of many kind, my family's been to many. Here's what the Church says about combined religious Sunday services. In the name of "ecumenism," some dissenters have been celebrating Mass with other faiths. This is strictly disallowed. Canon 908 Catholic priests are forbidden to concelebrate the Eucharist with priests or ministers of Churches or ecclesial communities which are not in full communion with the catholic Church. This isn't the first time in Oregon! St Paul Catholic Church, where we used to attend, used to do a psalm Sunday "celebration" with Lutherans, Anglicans, and a few other non-denominational churches. At the beginning, there were some things we would share (creed, prayers, songs) and then at some point before communion we would split into other rooms for our own "communion" service. As the years past, it went from splitting up into other rooms to sharing the altar to finally every pastor (more than a few) begin to put their "communion" on the altar and finally with directions that one could, "Choose any line." Thank God this stopped after much complaining. However, if you want a picture proof, you can get a picture of this terrible event in one of the St. Paul's old Catholic photo directories. Thanks for doing this, Carolyn. Did you know there's a labyrinth at the Grotto too? Donations, intended to keep St. Anne's Chapel open to the public, and maintained and repaired were given a half attempt, but then stopped renovating it. But the labyrinth is ALL DONE! How Bishop Steiner, Father Parker and Father Matt Tumulty can condone MoTA is beyond me. This isn't evangelizing; they are trying to water down our True Faith. Just reading on their website that they only separate when it comes time to receive their "sacraments" of "Holy Communion" should say something; Protestants' 'Communion' isn't an authentic Sacrament, since Jesus is not truly present in their 'Eucharist'. And, then, to definitively make a point to NOT separate for 'Holy Communion' on the final Sunday of the month, but to instead 'break bread' through a potluck, indicates an acute misunderstanding and lack of value of Jesus' True Presence in the Holy Eucharist! By the way, I didn't see anything in what I read on their website about other Sacraments, such as Reconciliation and Anointing of the Sick. So sad! Thank you, Carolyn, for bringing this to our attention. I wonder what the Archdiocese is doing about it; prayers are very much needed for all who have fallen away from our rich True Faith, and especially for those individuals who are in a higher authority who condone and, worse yet, promote, such a drawing away from the True 'Universal Church'--the Catholic Church. Wow. I'm very surprised- and sorry to read this. I know him quite well and never would have thought he'd make such a judgement, Carolyn. Bishop Ken has a very loving and caring heart. These are, indeed, difficult times. I believe we are living in a singularly historic period and God is very much involved. We must never waver from the Fullness of Truth- even to the point of unpopularity or death. His work is too important right now. There are lives and souls to save. We must stand fast and pray for the discernment of all. Thanks for this.....I esp. like Stan Nutting! didn't trust it and thought it odd that Father never went to these meetings. valid, but priests get upset if I question it). when I converted I never know what to say...theorectically 1978....I guess. God Bless you for caring about the One True Faith. I am glad to see you out and about. I hope you are doing well. I had a stroke which has left me a little wounded. I am doing better. Keep up the good work. We need you more than ever. One thing you have to know about Bishop Steiner is this: he hates any kind of confrontation, does not know how to deal with disagreements and will run at 90 miles an hour to get away from it. The "Mission of the Atonement, Lutheran and Catholic Congregation" is listed in the 2009 Oregon Catholic Directory on page 91 - as a mission of St Anthony Church in Tigard. Curious that the Directory lists one "Rev. Neil Moore" as "Priest Moderator", and advertises "Sunday Mass" at 9:30 AM. That could only be with the knowledge and consent of the Archbishop. It appears that the Catholic priest at least one time involved as so-called "pastor" is one Father Matt Tumulty, O.F.M. He's listed in the Oregon Catholic Directory as living in Portland, but with no assignment indicated. A priest may licitly offer the sacraments in a diocese only with the permission of the local bishop. So either a) he's doing this illicitly, b) he's doing this with the knowledge (and presumed consent) of the archbishop, or c) he's been appointed by the archbishop to do this. And only the local diocesan bishop (in this case, Archbishop Vlazny) has the authority to appoint a "pastor". Since this "mission" is listed in an official publication of the Archdiocese, it would seem reasonable to conclude that c) is the case here. This whole thing - including what I read on their own website - sounds highly irregular. Stuff that warrants the attention of the Congregation for the Doctrine of the Faith in Rome. Whose cardinal prefect is . . . oh, dear! . 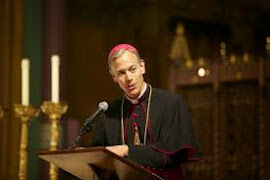 . . the former archbishop of Portland in Oregon, Cardinal William Levada! The "Mission of the Atonement" held its first joint "service" on July 6, 1986 - only five days after Levada was appointed Archbishop of Portland. This set in motion a series of meetings with St. Anthony parish, a Catholic congregation in Tigard less than five miles from Atonement Lutheran. In April 1986, St. Anthony’s members were invited into the plans that were in the works to form an ecumenical “mission.” Interested Catholic families met with representatives of Atonement Lutheran. The two groups went on retreat together, and then met for five weeks to plan for a new community. On Sunday July 6th 1986, the community held its first worship service together. The community had, and continues to have, a strong emphasis on lay leadership. Over the years, MOTA has been blessed with Catholic and Lutheran pastors committed to guiding the faith community in deeper understanding of its two traditions as well as its ministries in the global community. Twenty-three years after its founding, Mission of the Atonement continues to thrive. Mission of the Atonement continues to meet with both the current Catholic Archbishop and Lutheran Bishop. As far as I know, both Catholics and Lutherans (at least Lutherans in the USA) use the same Lectionary: so the readings at a valid and licit Catholic Mass on any given Sunday are likely to be the same as those in a Lutheran church. But only a Catholic bishop, priest, or deacon may give the homily at a Catholic Mass: that's canon law. And Catholics and Lutherans do not share the same theology of the Most Holy Eucharist: for them, it's only a sign, but for us it's the reality. That's because only a priest has the power and authority to change bread and wine into the Body and Blood of Christ: a Lutheran minister does not. I have attended Mission of the Atonement a number of times, and would like to clear up a few misconceptions regarding your attack on Bishop Steiner. 1) To my knowledge Mission of the Atonement has always been listed in the Catholic Directory (for over 20 years) as a Mission of St. Anthony's in Tigard. You may have been trying to find it listed separately. 2) Susie Snortum is a recently hired office staff person who doesn't attend MOTA, let alone speak for it. It is clearly stated before each service that each denomination maintains its separate identity and tradition. 3) Both the consecration and eucharist are done separately by the priest, so it is the Real Presence of Our Lord at the Catholic communion. 4) Labyrinths are not "less than Christian". There is one at the Sanctuary of Our Sorrowful Mother (The Grotto) also. The number of men and women who have deep-seated homosexual tendencies is not negligible. They do not choose their homosexual condition; for most of them it is a trial. They must be accepted with respect, compassion, and sensitivity." I hope this answers some of your questions, and thank you for advocating for life. I respectfully disagree on your observations on MOTA and St. Anthony's. Also this "attack" on Bishop Steiner which it wasn't..
1. Mission of the Atonement has morphed over time Look at the history.It is now the only so called Catholic/Lutheran "community" in the U.S. Do they have Rome's approval? The Archbishops wishes do not trump the Vatican for Roman Catholics. 2. Susie is a paid staff person who doesn't attend MOTA. Strange. "Too many in the Roman Catholic Church believe that ministry is not about "being" like Jesus, but about peeing like Jesus." 5. Observe the "Gay Pride" parades and what this lifestyle also morphs into. Loving people is easy. Helping them see what's destroying them is hard. Welcoming Congregations accept them and their actions. This is not what the Catechism says fully. You seemed to be picking and choosing. Do the Welcoming Congregations encourage chastitiy? Love the sinner hate the sin, as Jesus does. The Catholic church never has condoned homosexual activity. It is a trap as is MOTA. I want people to see the wonder of the Catholic Church without things that detract. I hope you understand now why I'm concerned about Bishop Steiner. Being concerned, tough love, is not attacking him. Hi Carolyn, hope you're doing well. Vatican II permits non-Catholics to receive Holy Communion in a Catholic Church only on rare occasions when a non-Catholic cannot find a church of his denomination. This is not a “rare” occasion. Those interested in Davies' speech can download it at http://www.keepthefaith.org/detail.aspx?ID=1292 . Thanks for your contribution to bringing light into the darkness. Thank you also for the web link regarding confusion and deception after Vatican II. It seems like good church pew sitting Catholics are tired of trying to find a decent church in this Archdiocese to attend, while "hybrid" churches are encouraged by our Western Oregon Bishops. Don't go to Eastern Oregon and try to pull this. Bishop Vasa walks the talk. These just blow bubbles.